Give your child the opportunity to succeed at the highest level! 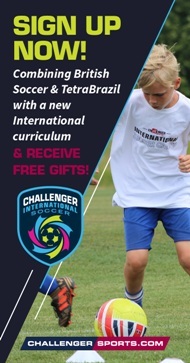 Our International coaches are coming to you to offer professionally ran practices and sessions that are focused on developing your players individual techniques and skills needed to reach the next level. All our practices are taken from our Developmental Curriculum that has been designed by soccer experts from around the world as we highlight the skills and needs for each Academy Phase of Development! Space is limited in each session – please register on line now to reserve a place for your child. Three hours a day from Monday to Friday. 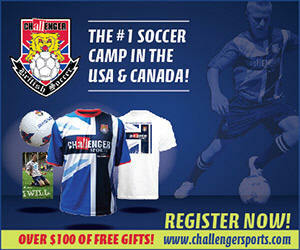 A great way to introduce your child to the NEW and Exciting MINIKICKERS Program offered by Challenger Sports. Young players learn and practice the fundamental skills of the game as well as develop their motor, social and psychological skills. Our British coaches are experts at working with young children and will combine fun soccer games with skill building activities and storytelling. Elements covered will include dribbling and controlling the ball, turning with the ball, boundaries of the field, and scoring in the right goal! These key skills will be developed through various themes and use of the imagination to create a high energy and positive environment for each player! Campers should bring plenty of water, sunscreen and snacks. Regular water breaks will take place and campers will be allowed supervised access to the church playground for a small portion of time each day.